To reach this figure alone, is a real big thing for me and i can't thank you all enough. Just a short update to say " thank you so much to everyone supporting and following, i cant tell you all how much i appreciate it "
Reaching 5000 means so much to me and even if it doesn't make it al the way, the support and fantastic feedback has all been worth so much to me..
Once back with me, it will be making the rounds at various UK lego shows..
A bit of fantastic news concerning this car and some of my other builds, earlier this year a freind nominated me as a good builder for the up and coming Lego House project in Billund, as a could be displayer.Brilliant just to be nominated, so i was more than happy for it to be just that..
A short while later, i received an email from Lego, finding out, i was to be displaying amongst some of the most talented builders from around the world, something in my wildest dreams, thought would never happen, i feel so honoured. 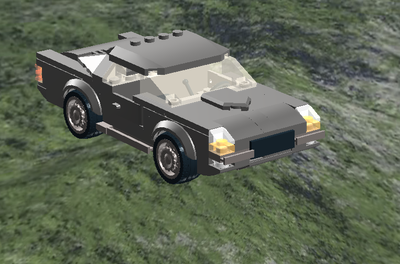 So, for 12 months, This car and 5 more of my builds ( pre april 2017 ) will be display in the Master Builder Gallery. Again, many thanks for you much appreciated support, if the chance arises, a visit to the New Lego House, its amazing, I cant wait to go back, but with my family next time. Thank you every one, it means a lot to me ..
Third of the way :-) Thank you so much every one, i cant tell you how much i really do appreciate your support in this. 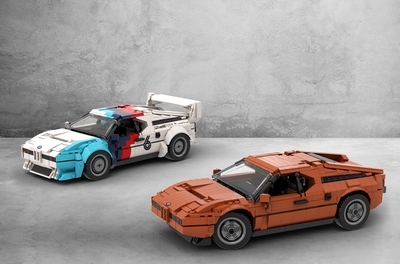 Blog by : the lego car blog. Red has produced a monster-sized vintage racing car. Loosely based on a 1932 Alfa Romeo, this car has the aerodynamic streamlining that was all the fashion at the time smooth built in bricks. It also features working steering and an engine that uses so many ray-guns as greebles that it could almost be part of sci-fi SHIPtember. Red has included multiple views in his uploads but we really liked the straight profile shots, which are an unusual way to present a MOC. Click this link to Flickr to more views and under the bonnet..
Just a quick thank you update. Your feedback has been brilliant on this project. I cant tell you all how much i appreciate it all. 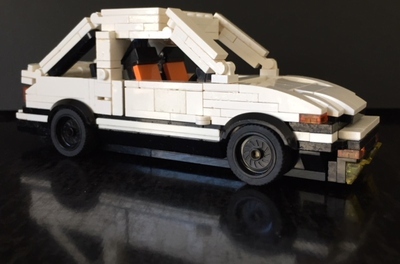 Also, i've just had the pleasure to display this car amongst others at ' brick con in sheffield '. where i met a few of your good selves . Design idea : before i came across enough of those 'giant 56mm' wagon wheels, i had been toying around with various alternatives..
playing around with the camera settings. Firstly, i would like to say a MASSIVE thank you to each and every one of you, i cant tell you all how blown away i am by the response and truly fantastic feedback. your the best - I'm really glad you all like this build. A few have mentioned and asked about the wheels . Nice one, they are my personal favorite parts of this car. 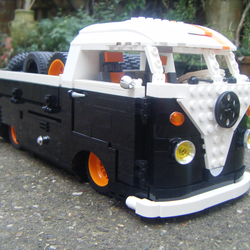 Before building this, i had made a few motor bikes with brick built wheels, That used the same tires as on this. and having sourced a few of them thought they would be perfect for a period racer. The tires came from set number : 8422. and a couple of bricklink orders. Originally i was going to build the wheel/hub parts in a similar way to the motorbikes i had made prior to this.. " bikes can be seen on my flickr pages "... as i only had two of the pearl gold wagon wheels at the time . Lego describe these wagon wheels as giant at 56mm and also came via bricklink, but i believe where only available with one set number 7188 kings carriage ambush .. which only had two in this size. The first wheels for this used black chain links for the rims, but i thought they where lacking in something... i think using the brown ones from my starwars hailfire droid set and a couple of ebay purchases made the difference and lifted the design. i had used this idea on a previous catamaran build ..
Also, i should have mentioned when submitting this. The wheels spin really well and it fly's across my kitchen floor, a bit too fast mind, ( i crashed it the first time). Another detail... to achieve the positive camber on the front wheels, ive used two , one on each side.. motorcycle steering pivots : 2904 .. placed upside down. One more detail, the Number stickers where cut from a sheet of fablon sticky back plastic.. 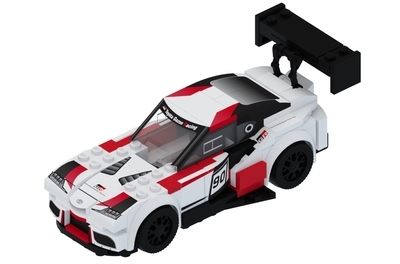 There is one detail i wish i could add , and that is how many pieces used, i really do wish i had counted them when building..